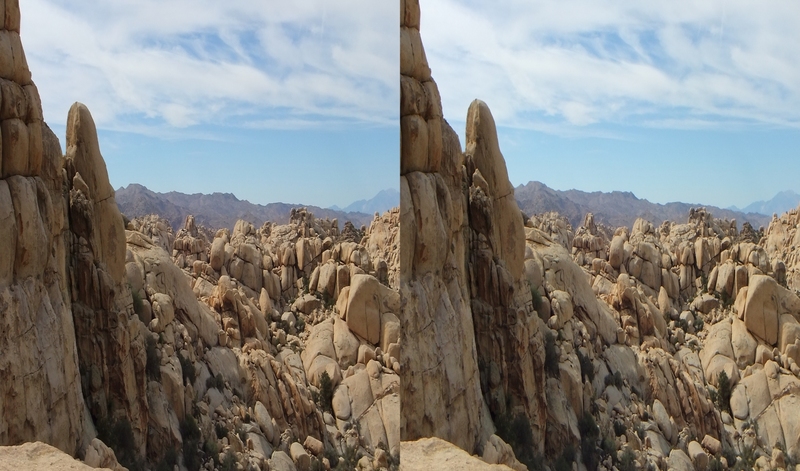 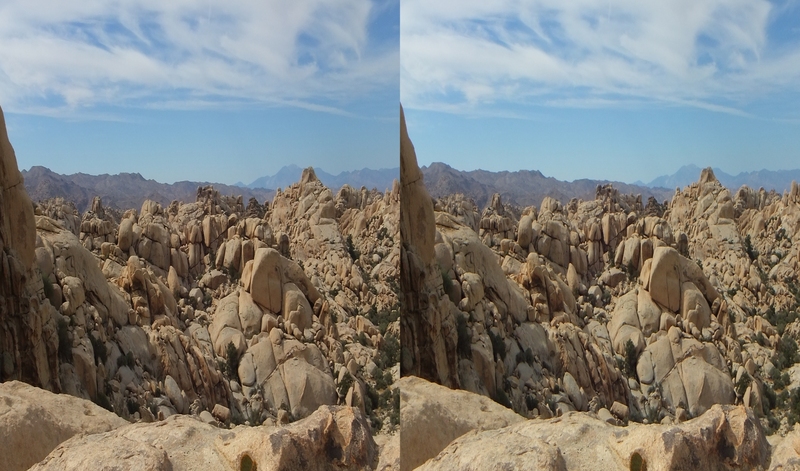 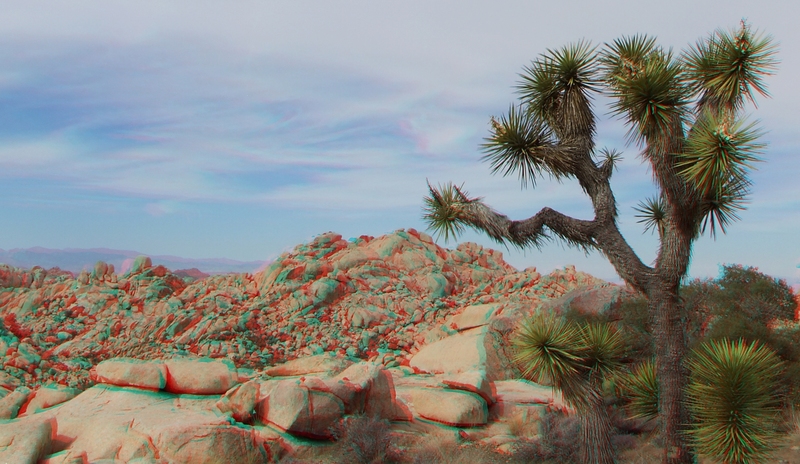 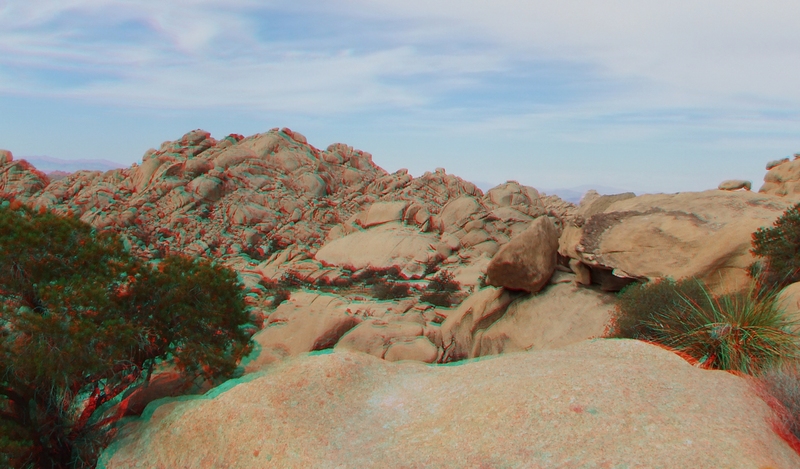 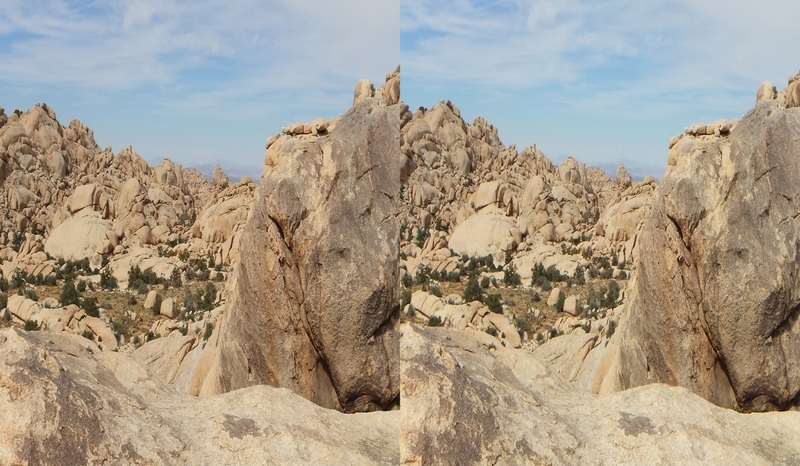 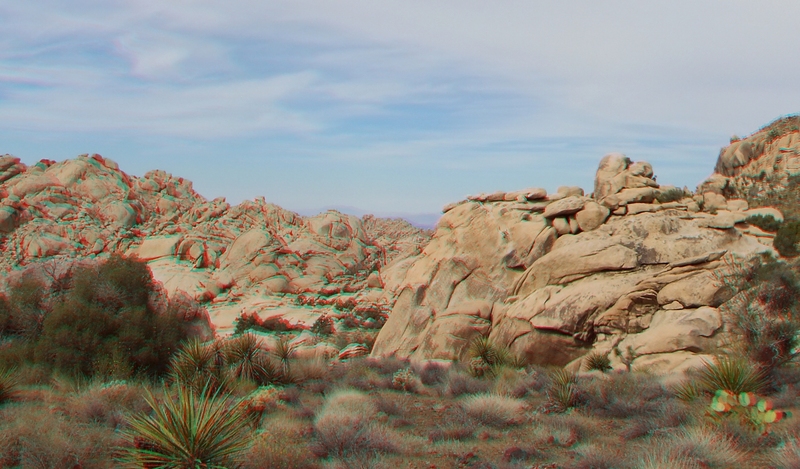 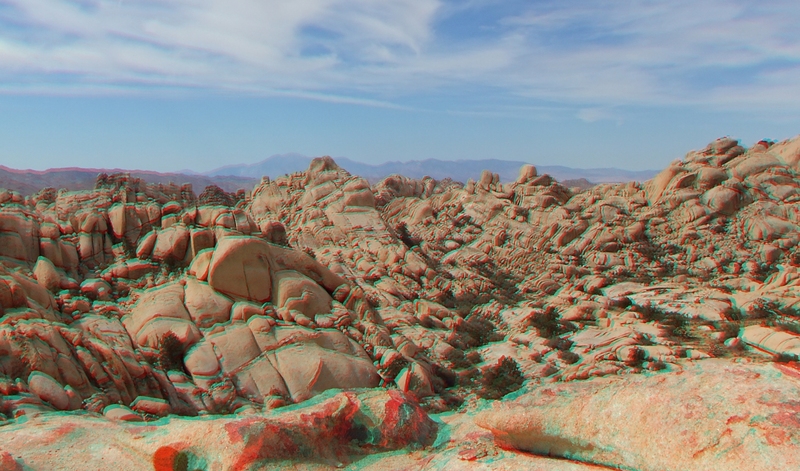 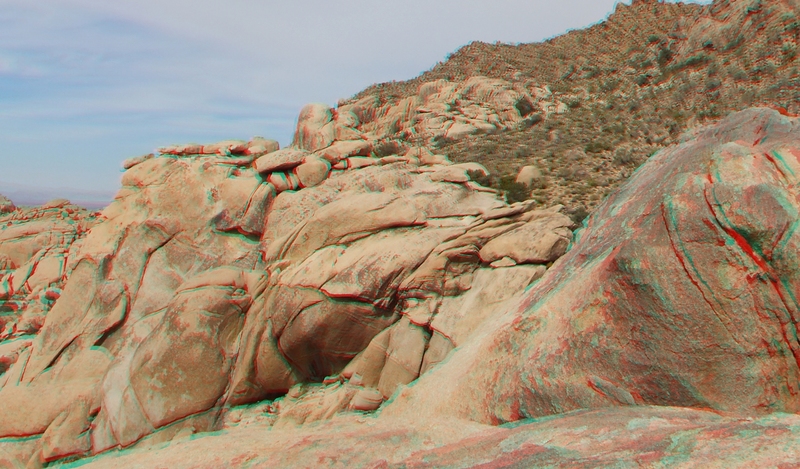 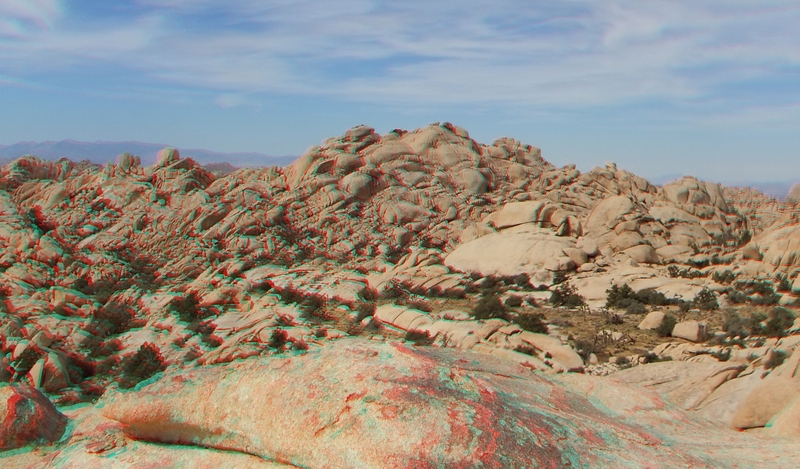 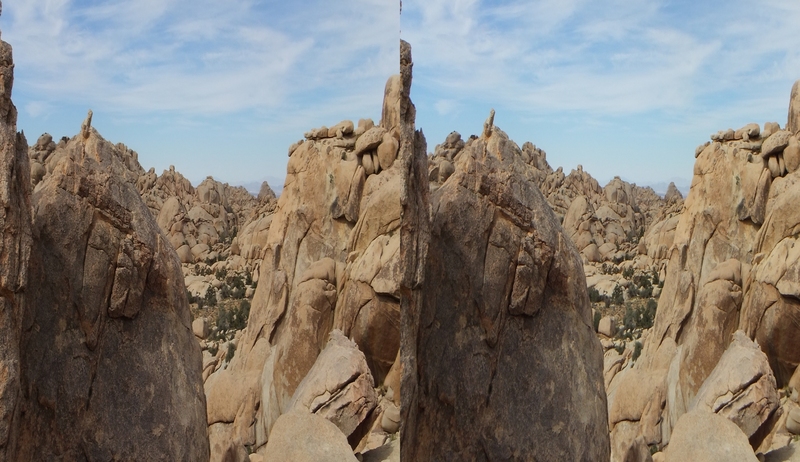 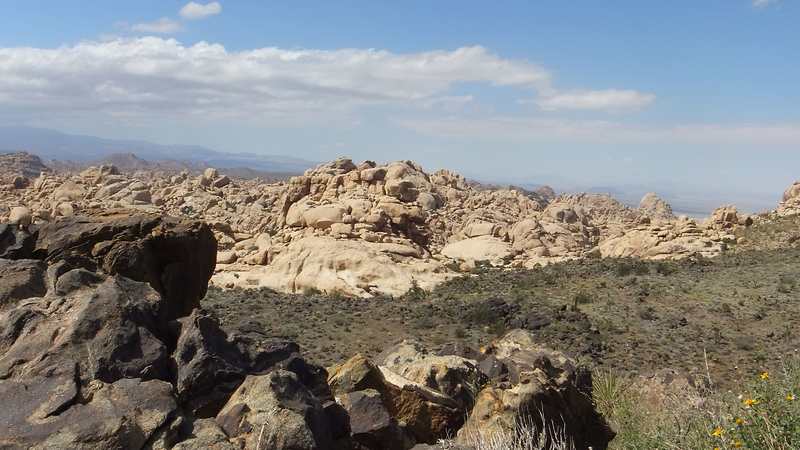 One of the best views ever if you wish to enjoy Joshua Tree’s “Crown Jewel”—the Wonderland of Rocks. 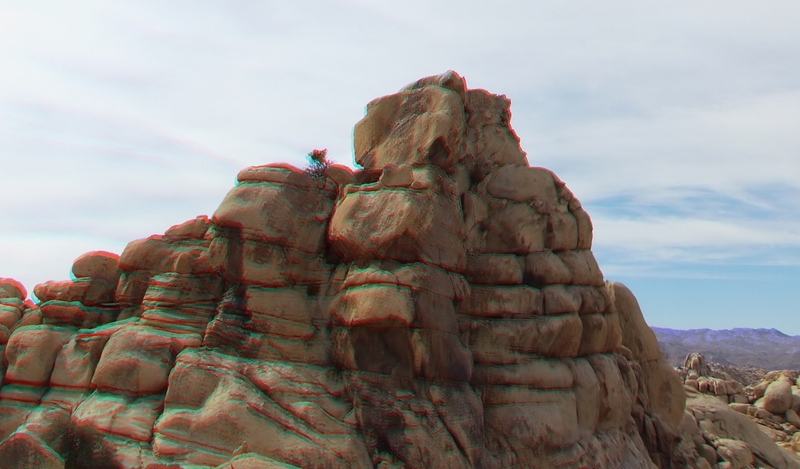 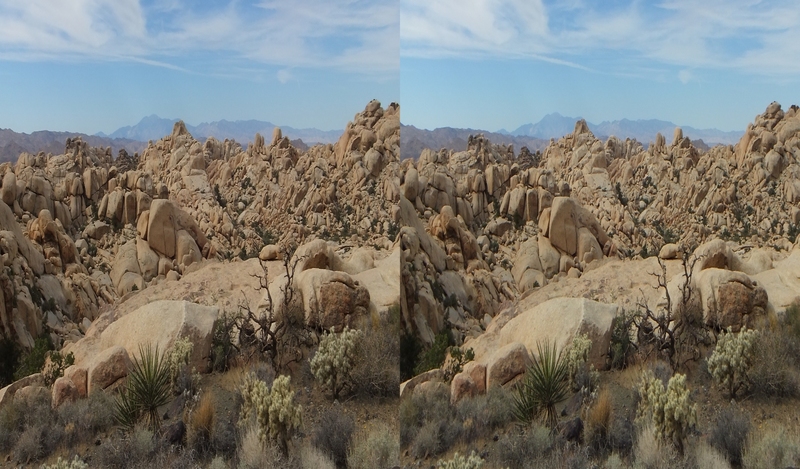 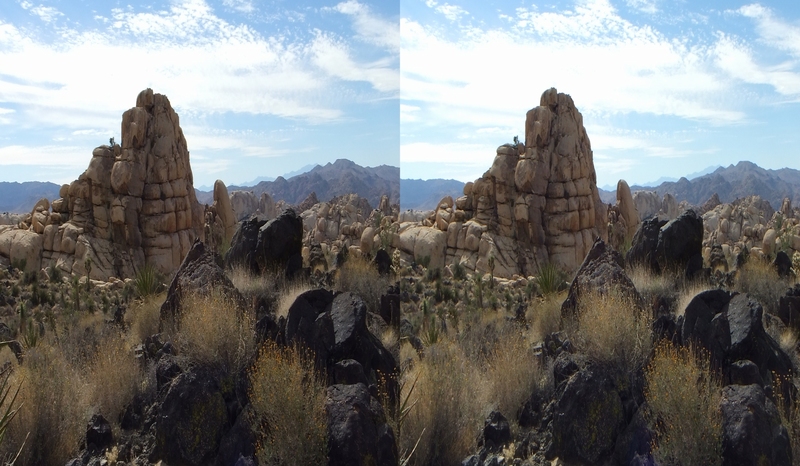 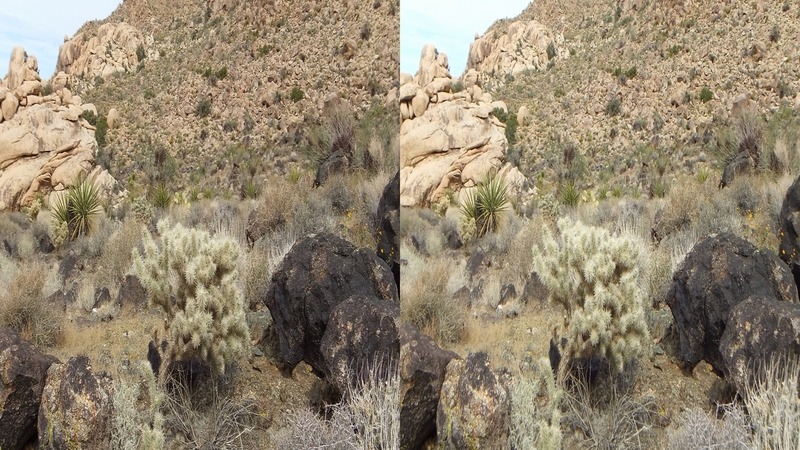 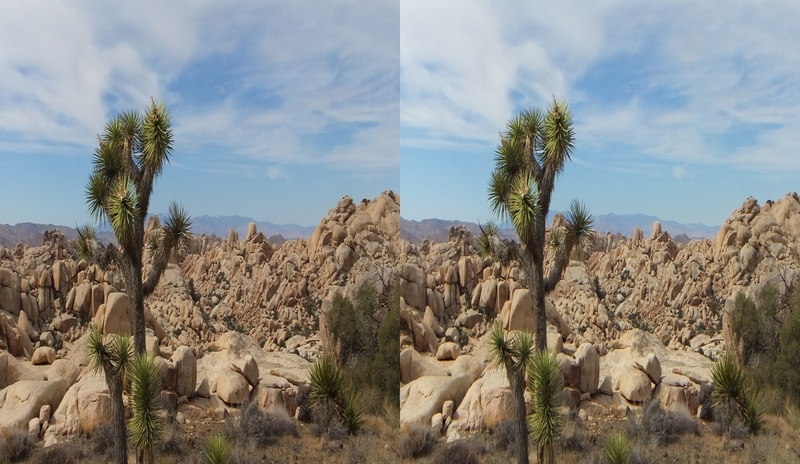 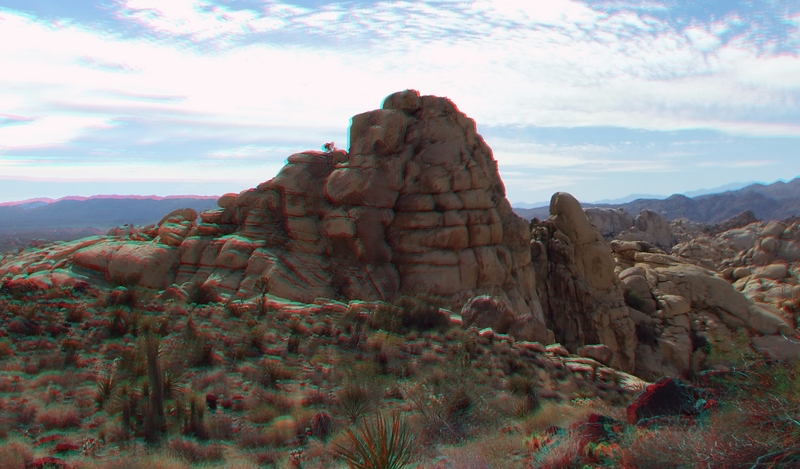 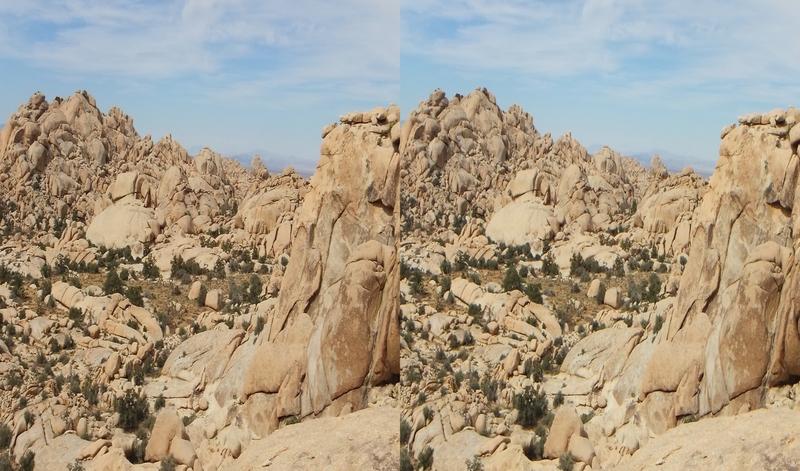 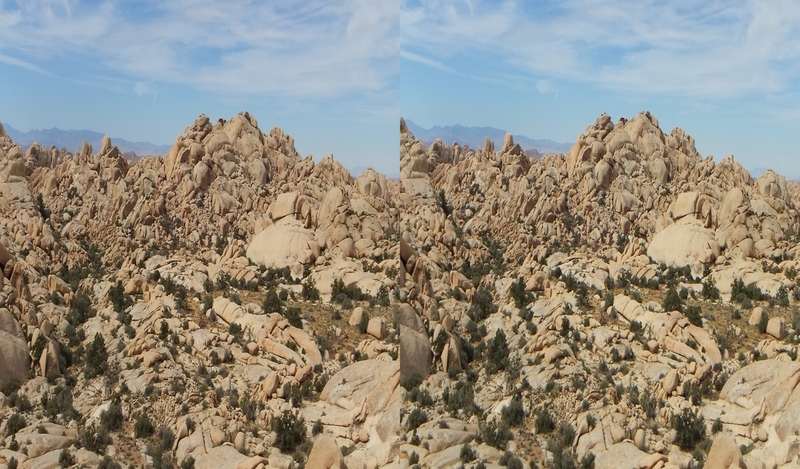 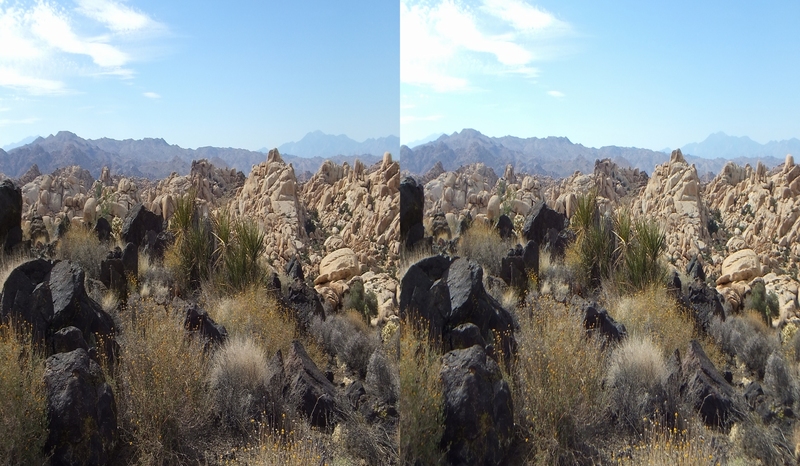 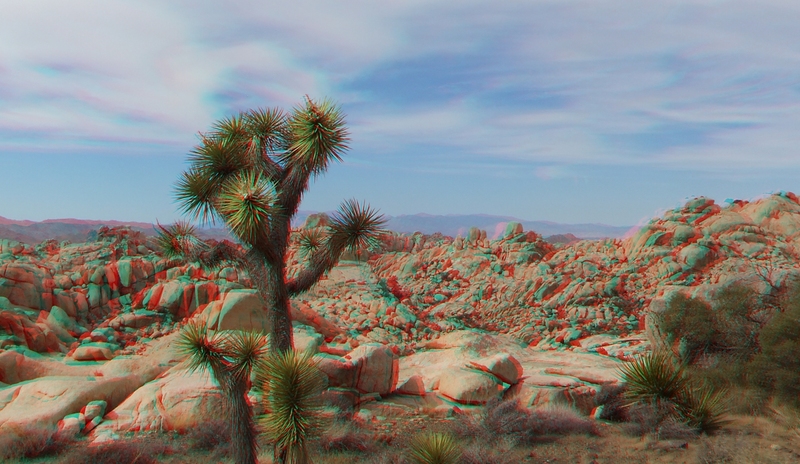 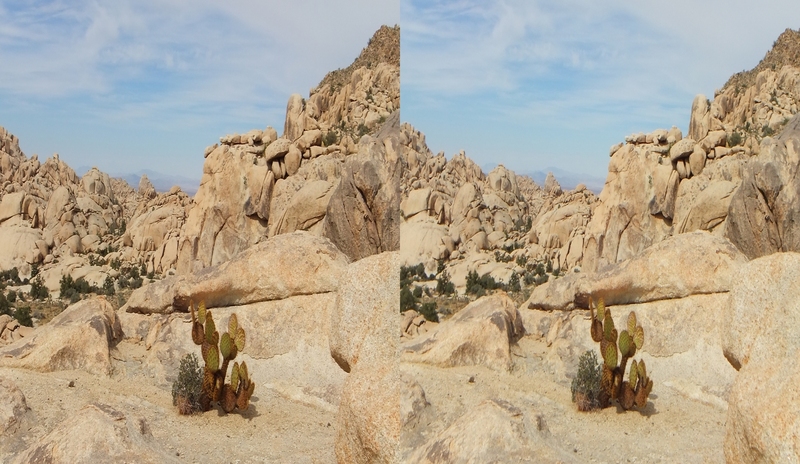 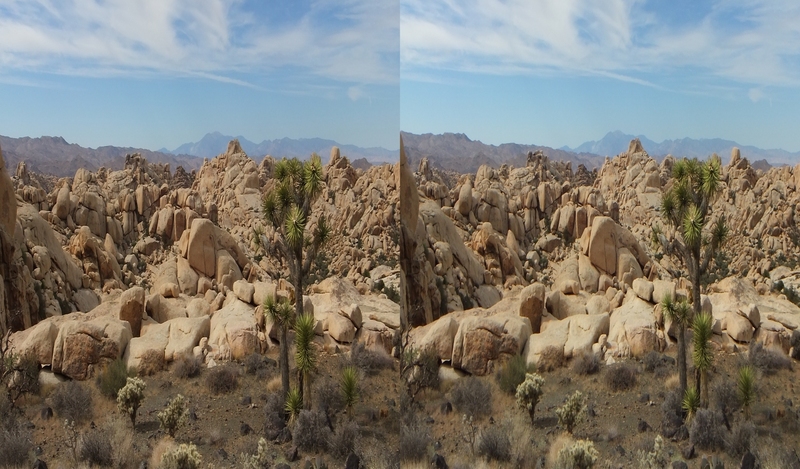 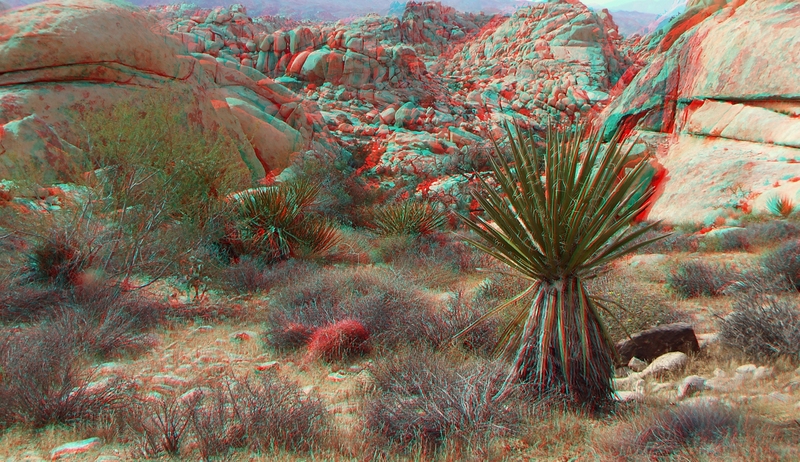 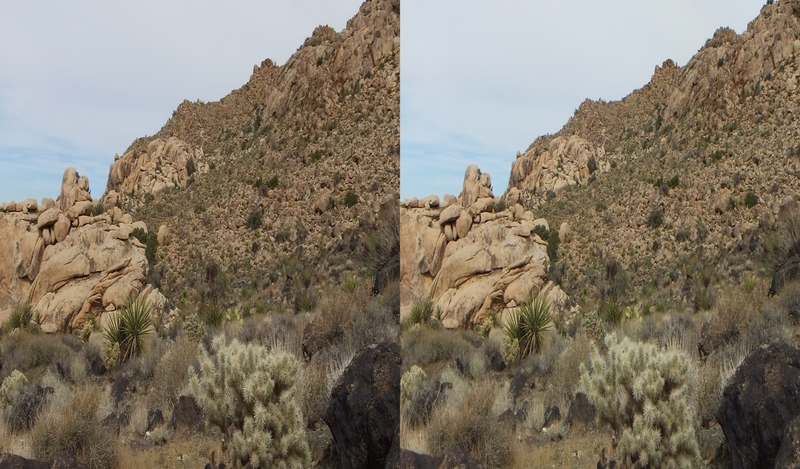 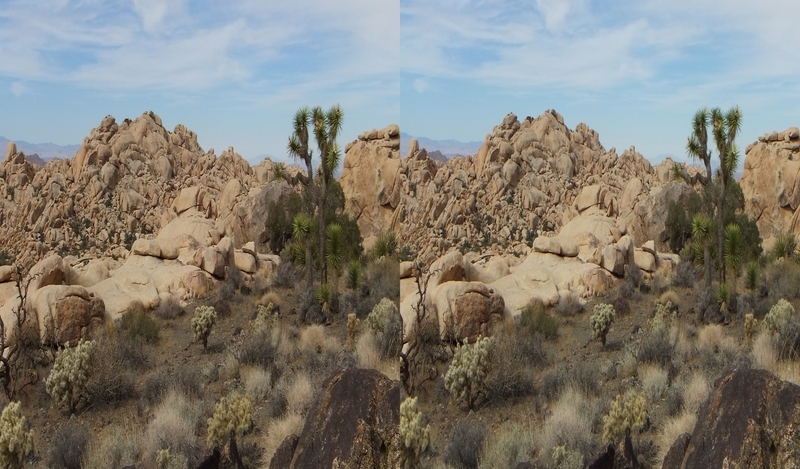 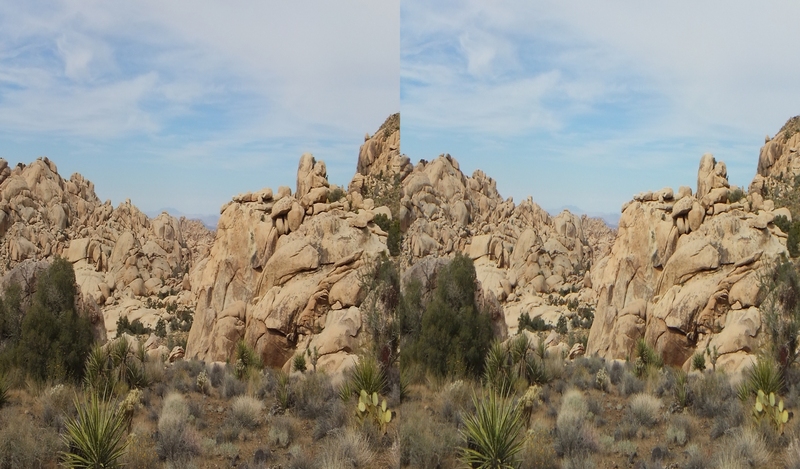 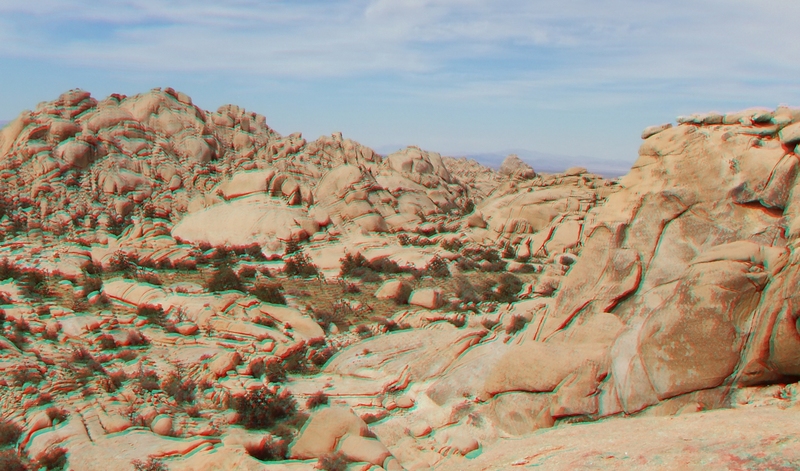 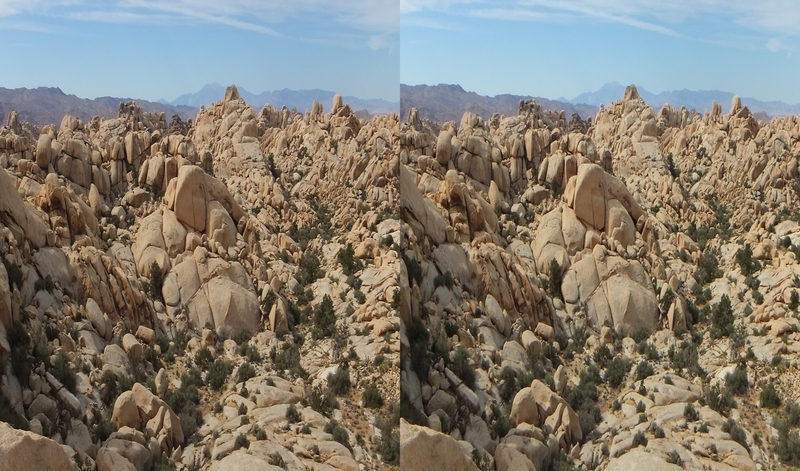 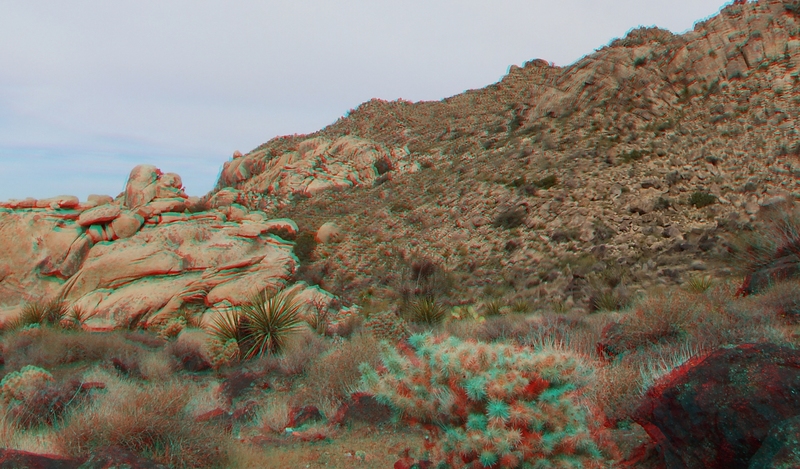 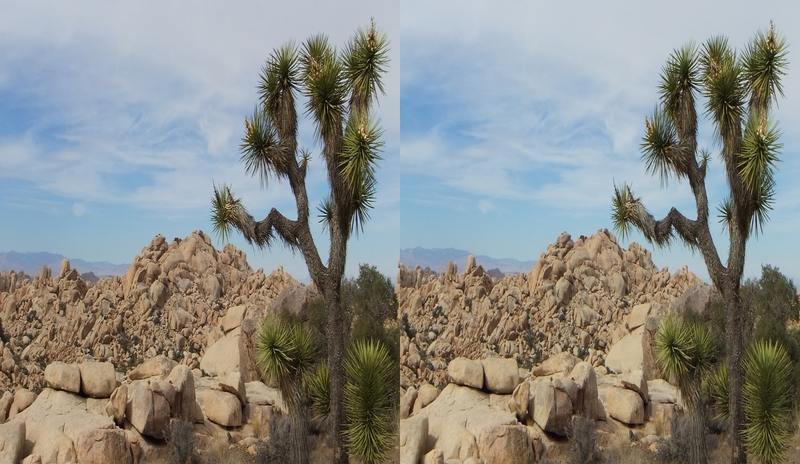 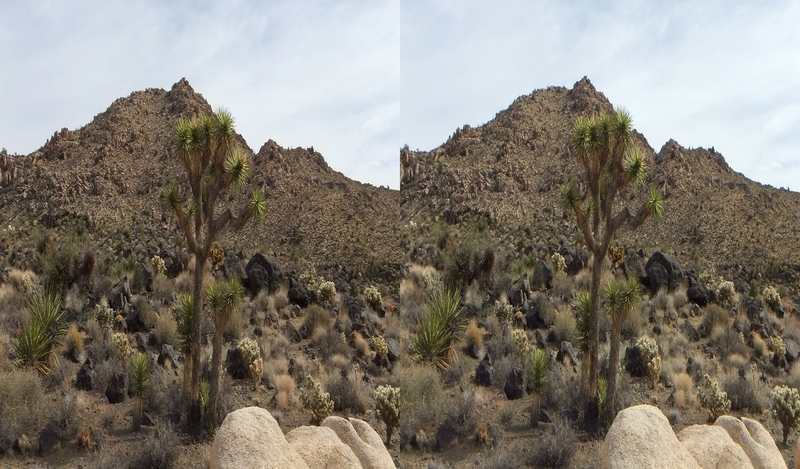 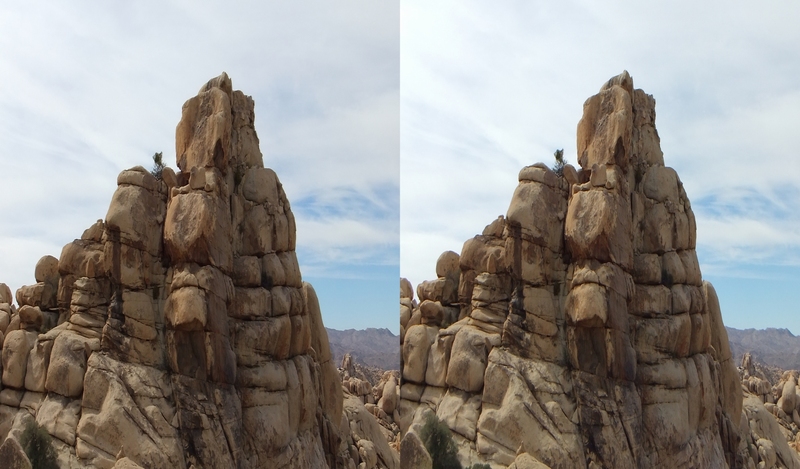 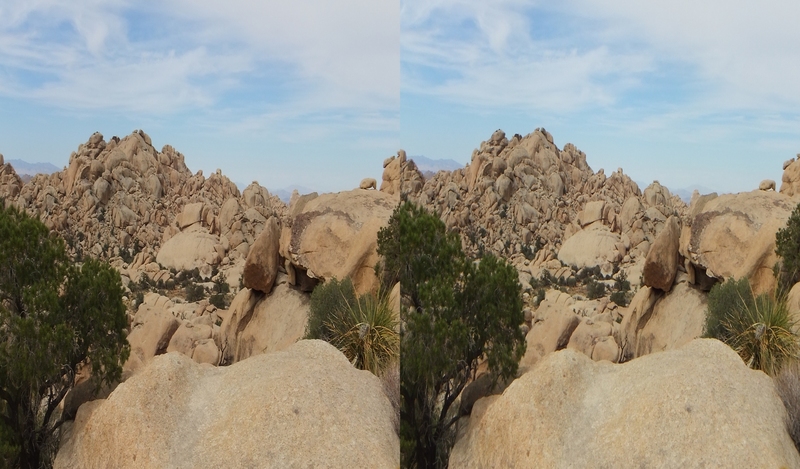 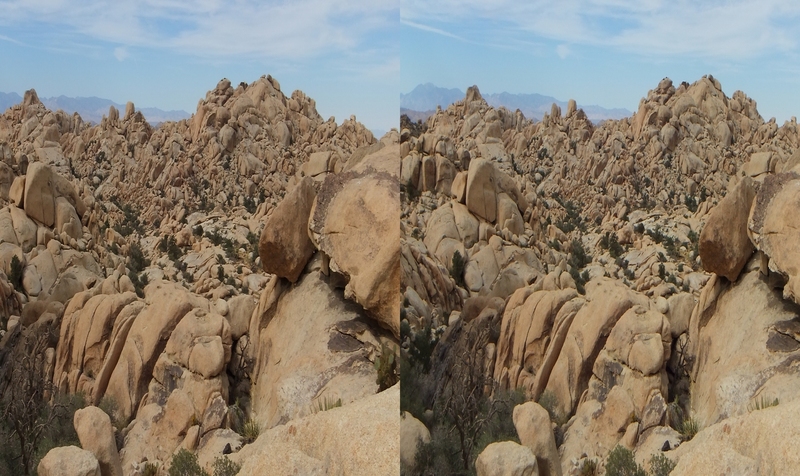 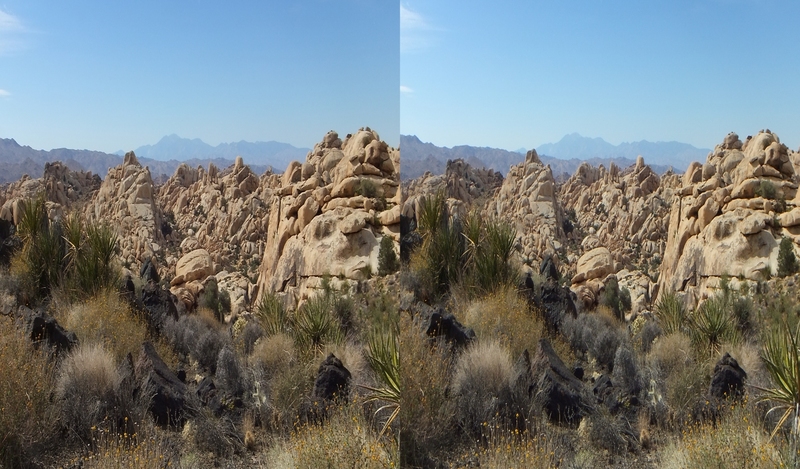 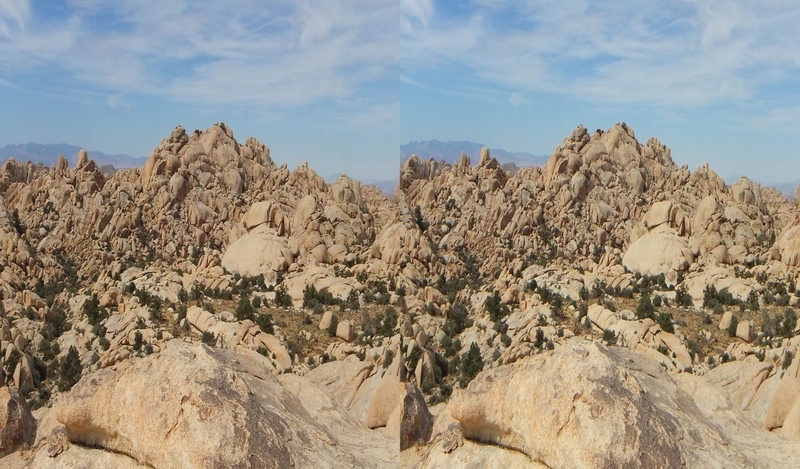 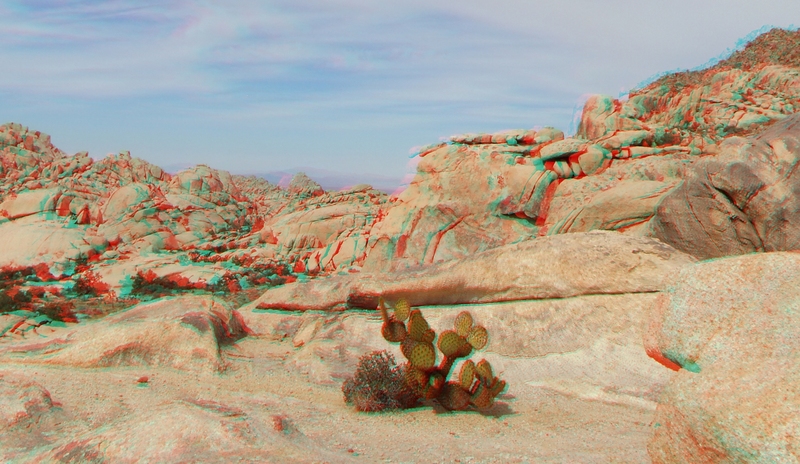 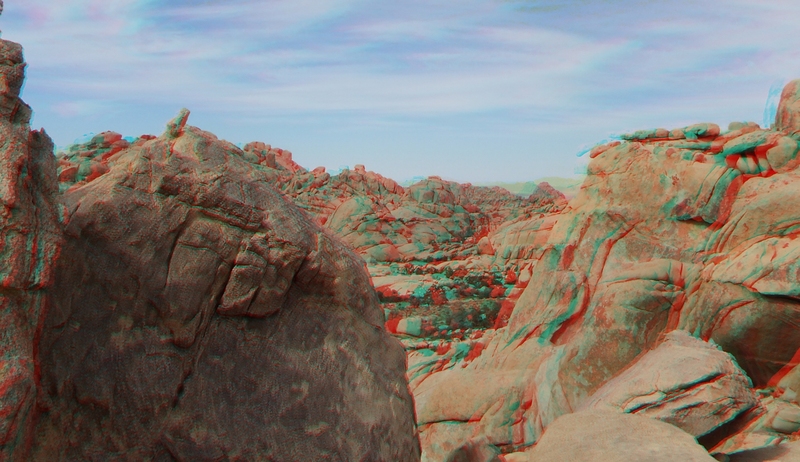 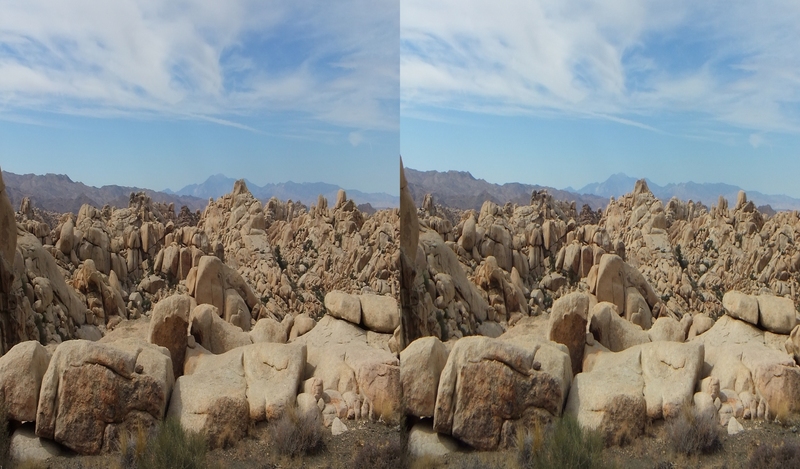 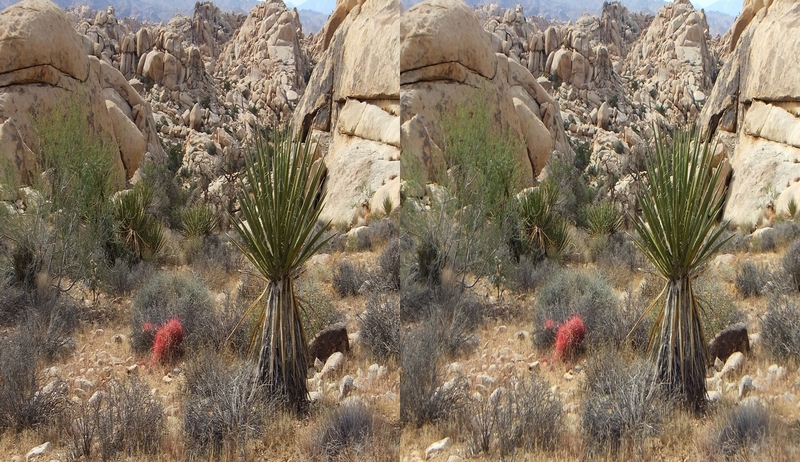 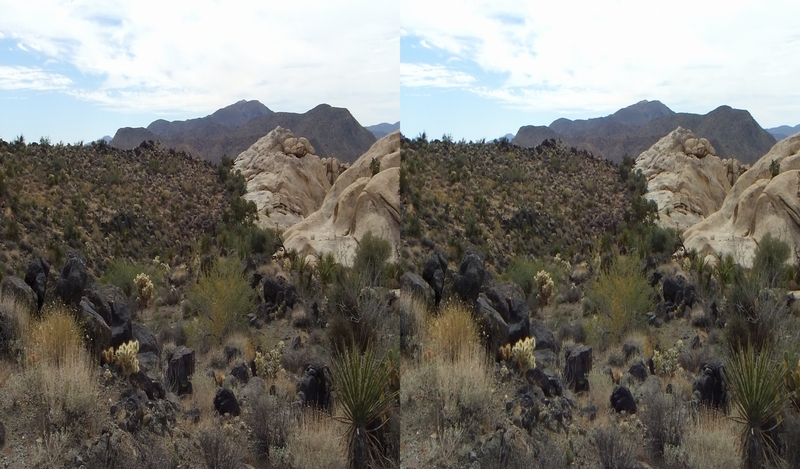 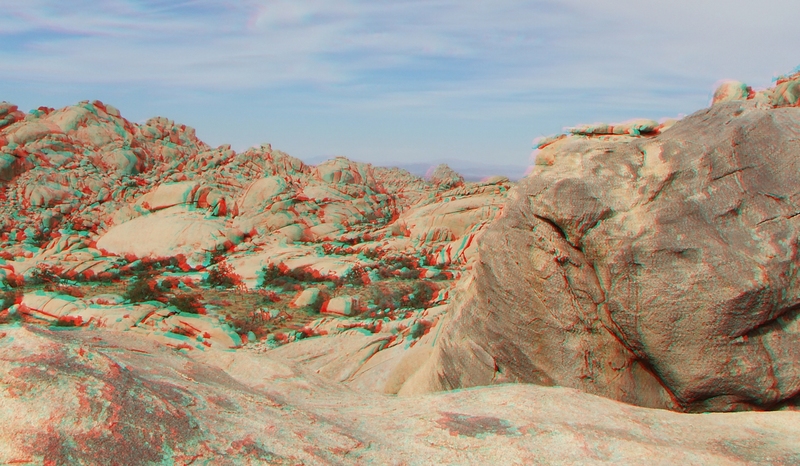 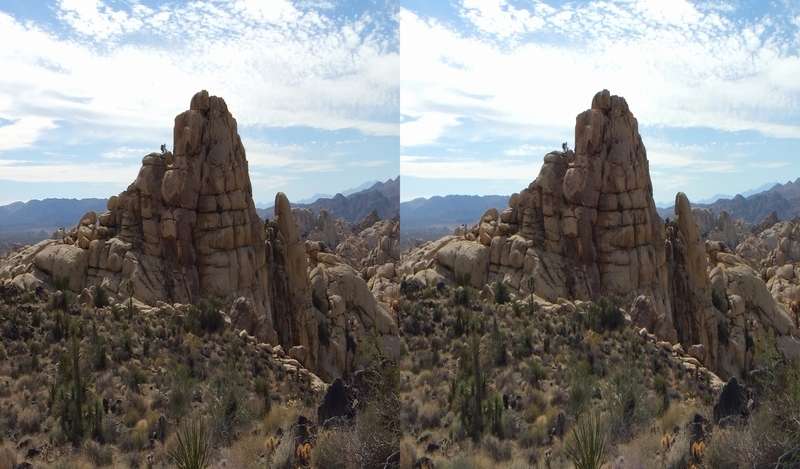 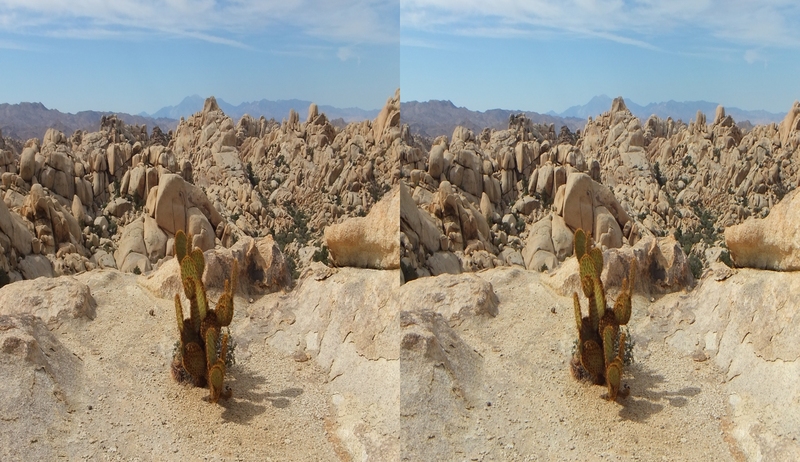 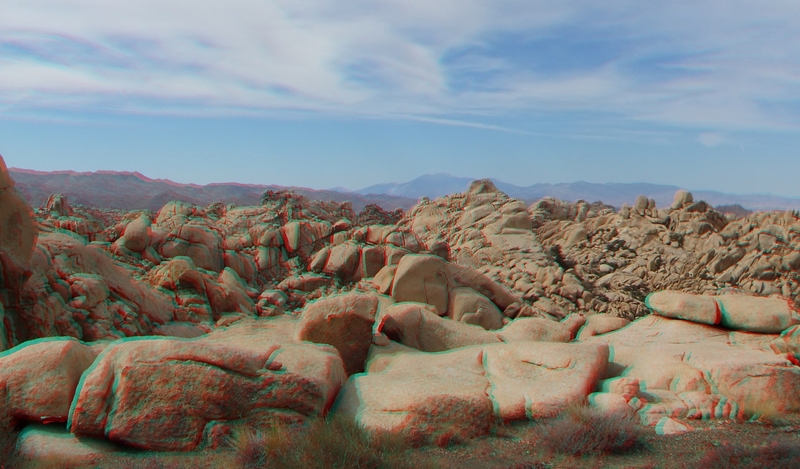 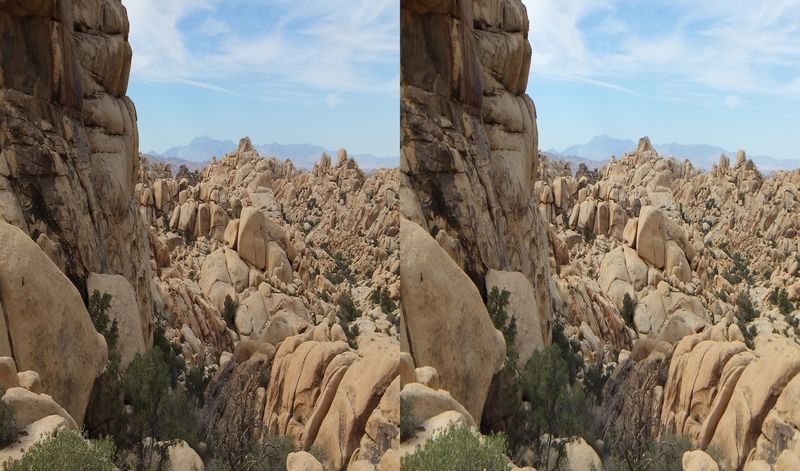 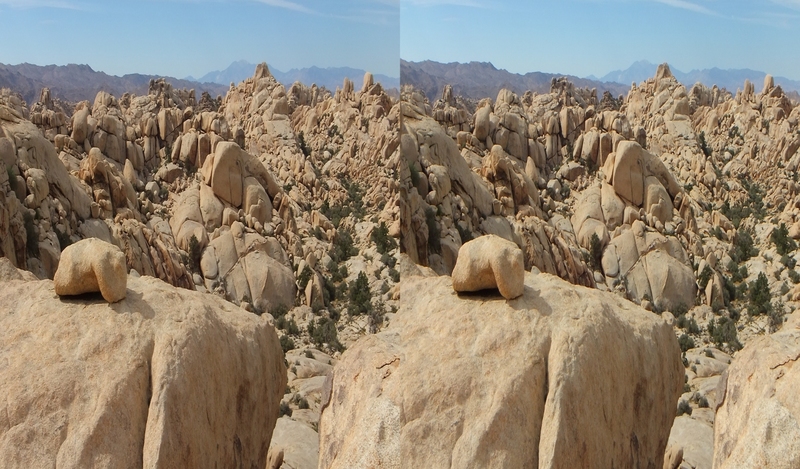 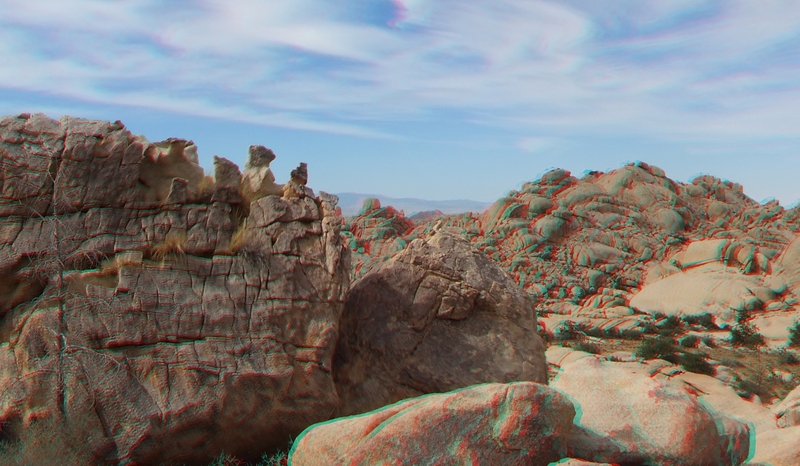 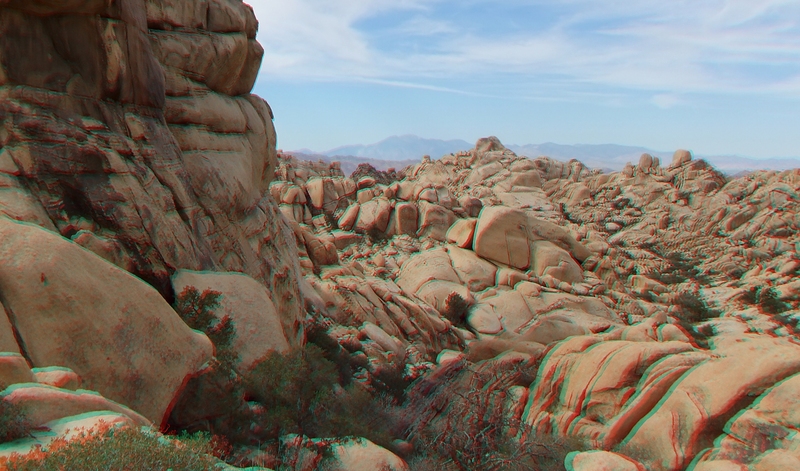 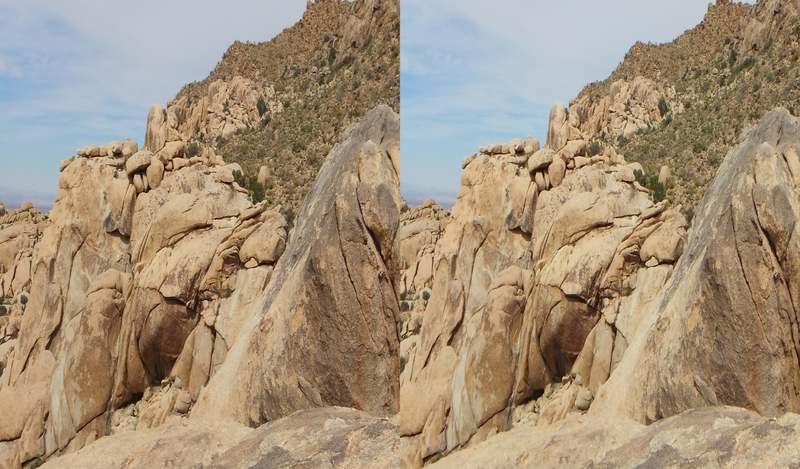 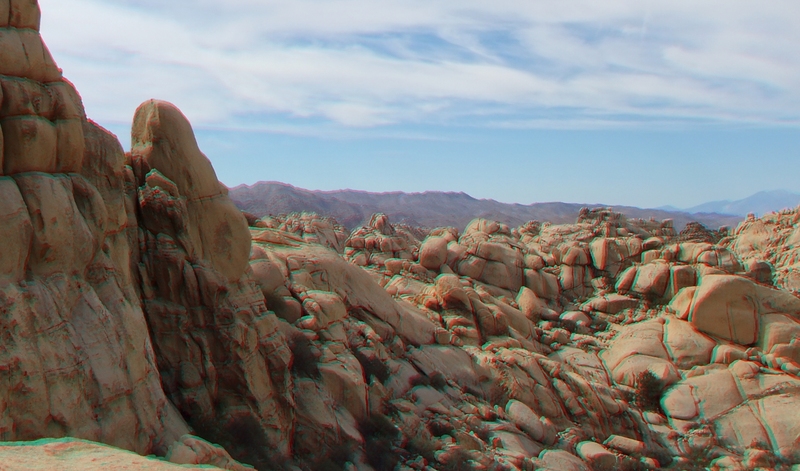 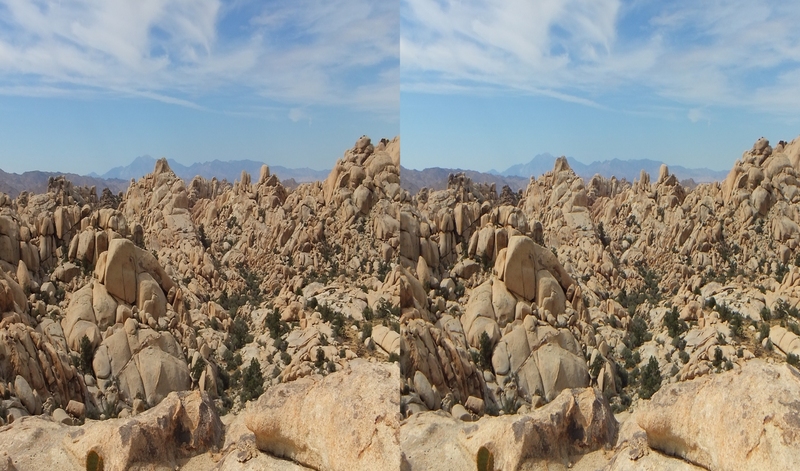 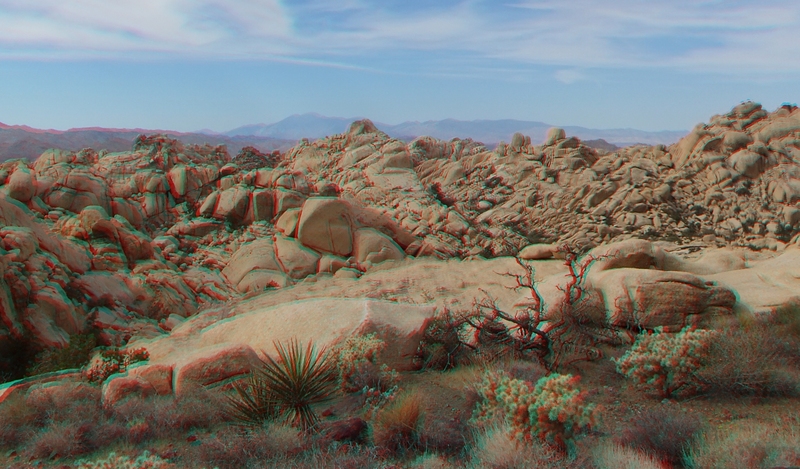 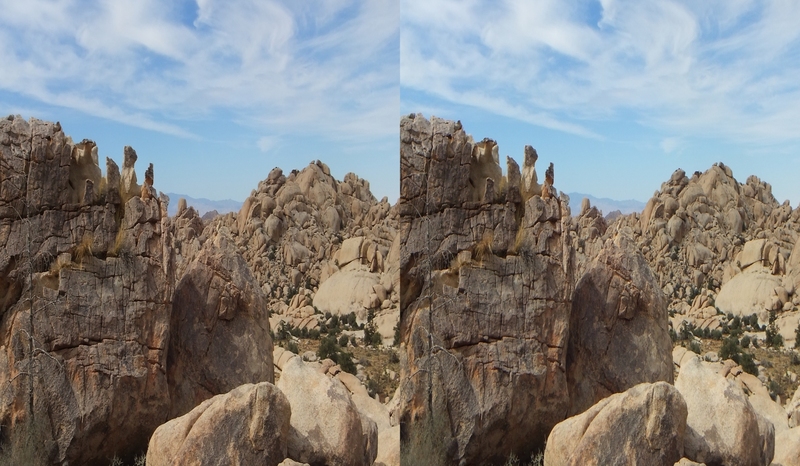 JOSHUA TREE NATIONAL PARK, WONDERLAND OF ROCKS. 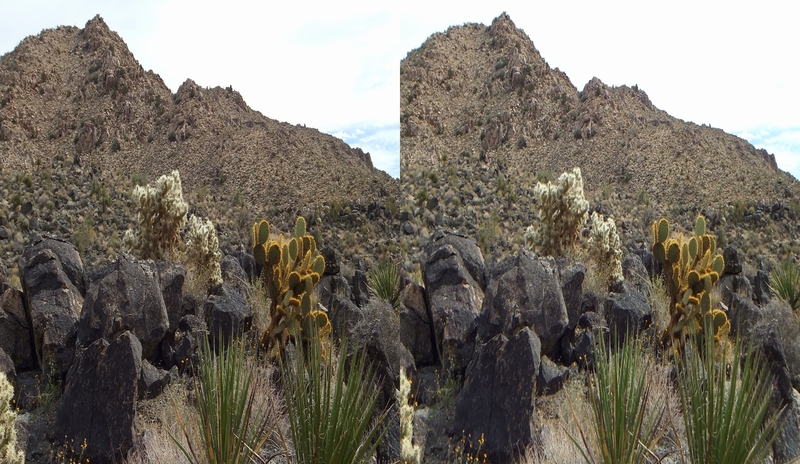 The two Don Genero Cliff Galleries cover an area about a mile and three-quarters from the dirt parking lot. 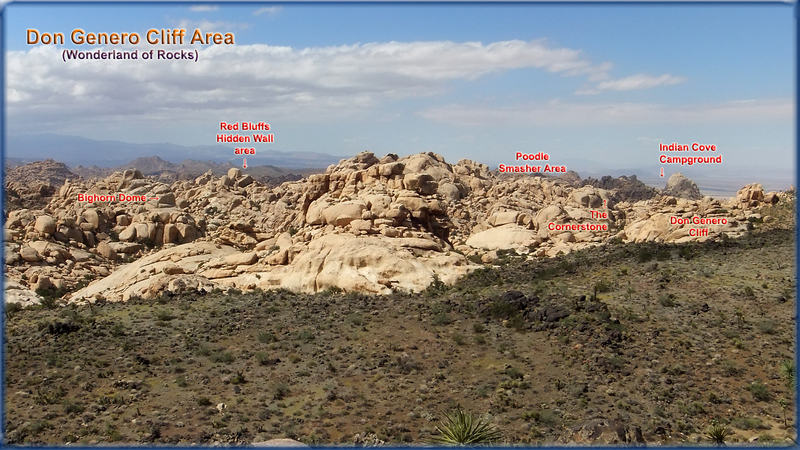 They can be found at the northern extremity of the Wonderland of Rocks eastern hillside. 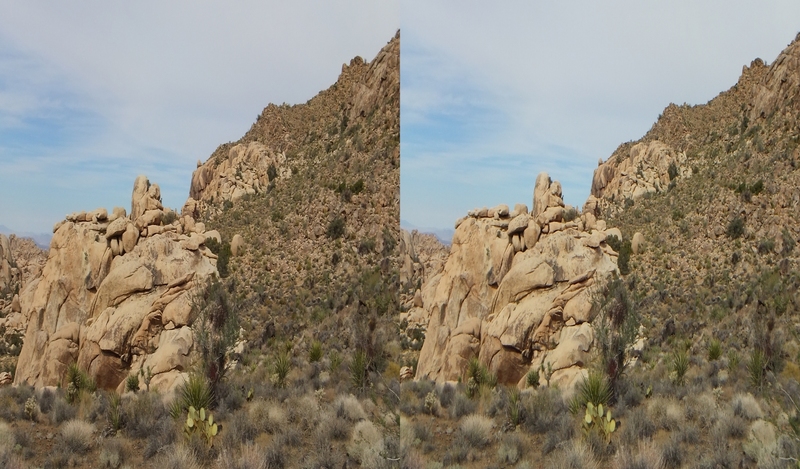 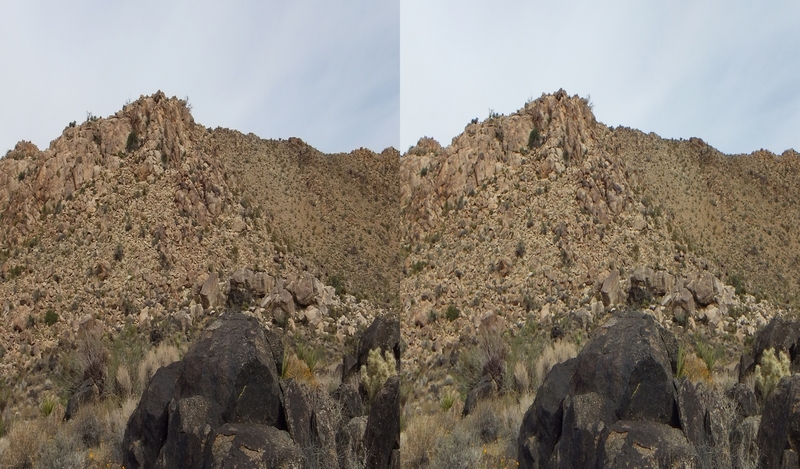 It is an area where the contact between Queen Mountain on the east, and the lighter-colored granite of the Wonderland rises to a low, rolling cliff. 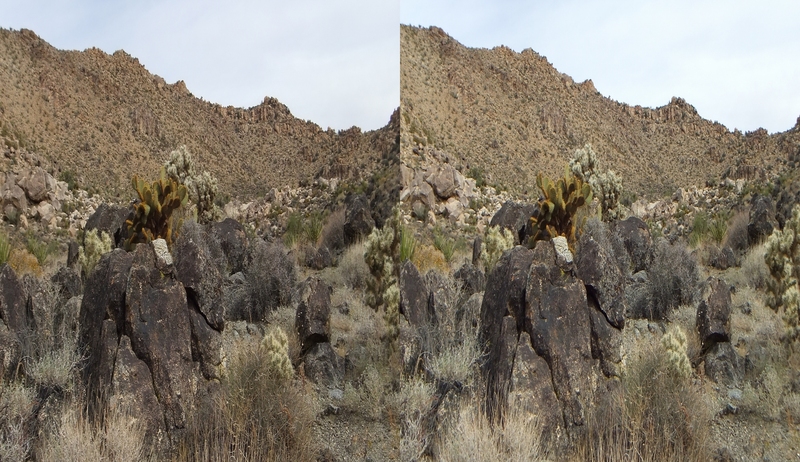 The 3D Gallery presented here includes features right along the cliff edge as well as one or two hundred yards further east. 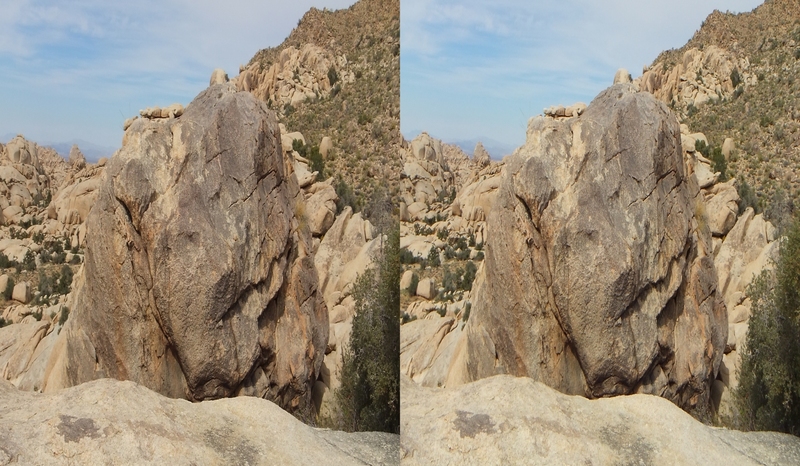 Rock climbers dubbed this spot after Don Genero Rock (which lies at the base of the cliff). 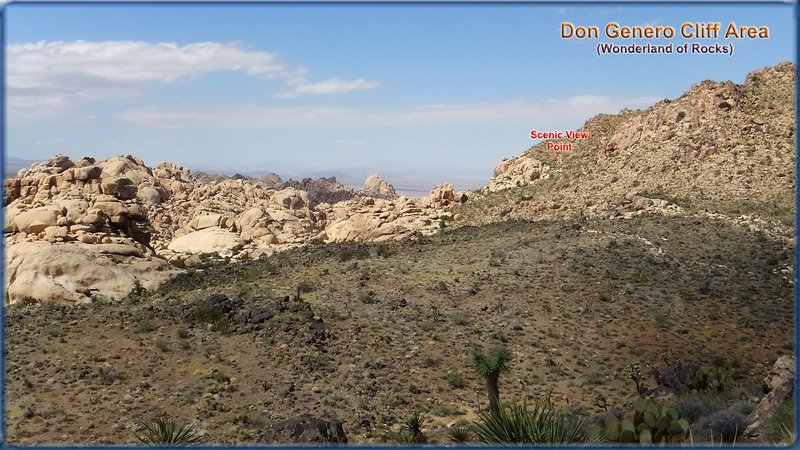 Anywhere along the zone it is possible to scramble out onto the cliff ledge for a glorious raven’s-eye view of Wonderland Wash below. 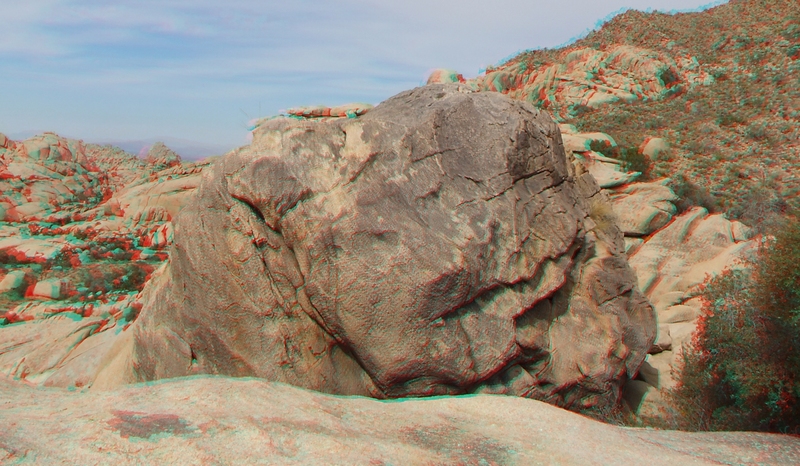 But be careful; it is easy to slip on the old crumbling granite surface. 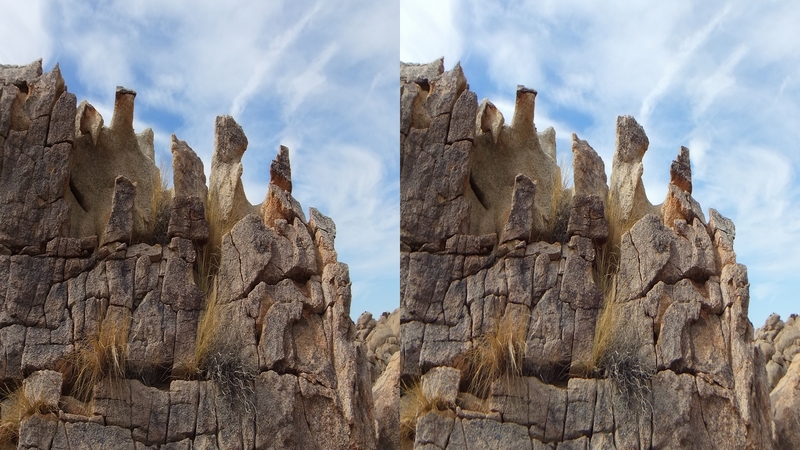 The cliff face itself is approximately 125ft to 200ft high. 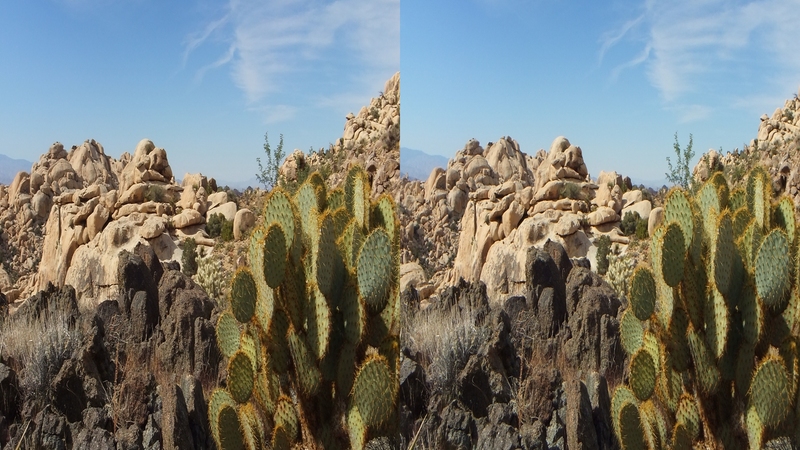 From the edge, visitors peer deep into the “Far East” of the Wonderland, with glimpses north and west of Joshua Tree township, 11,000ft Mount San Gorgonio forty miles off into the distant—and closer to home, the outback known as “Lost in the Wonderland”. 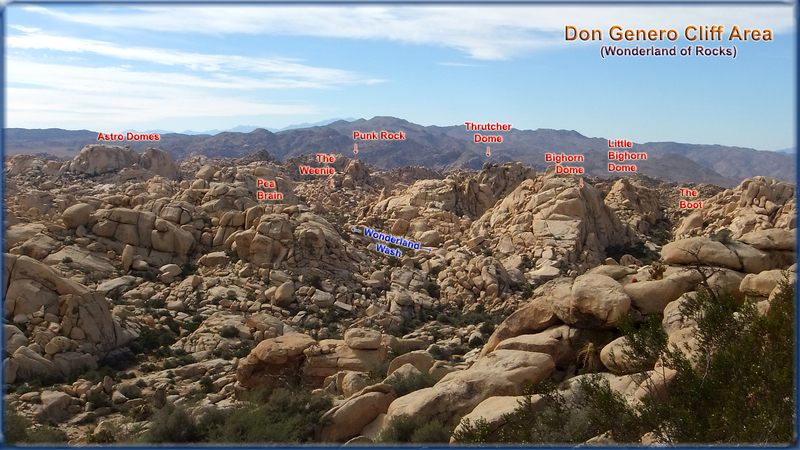 Thank you for visiting the Don Genero Cliff galleries. 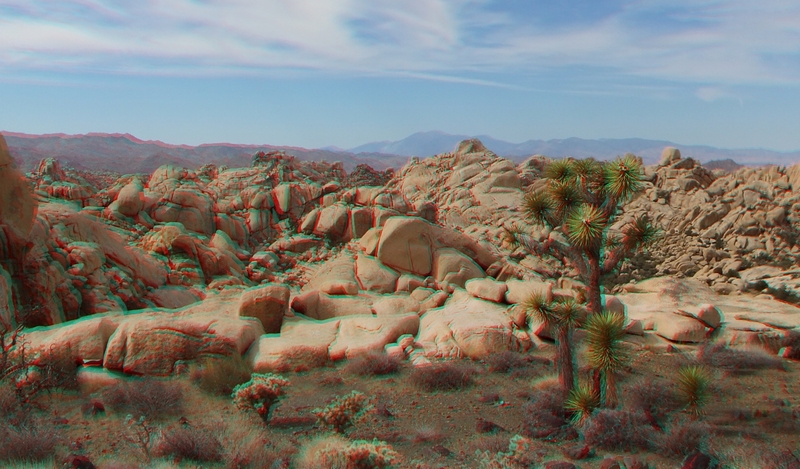 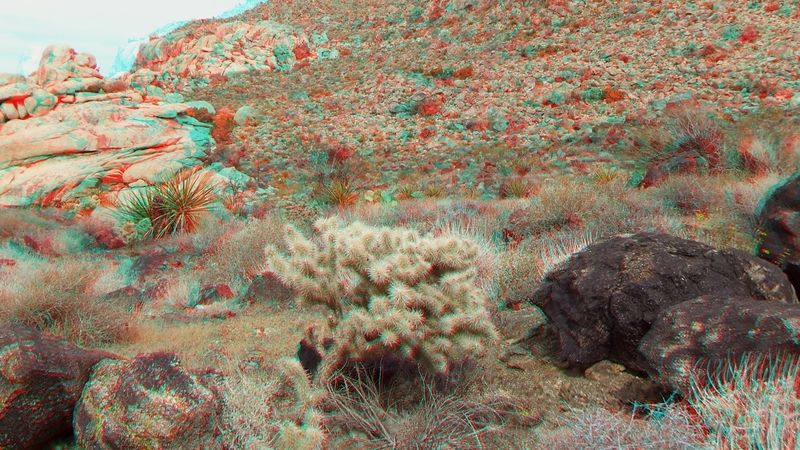 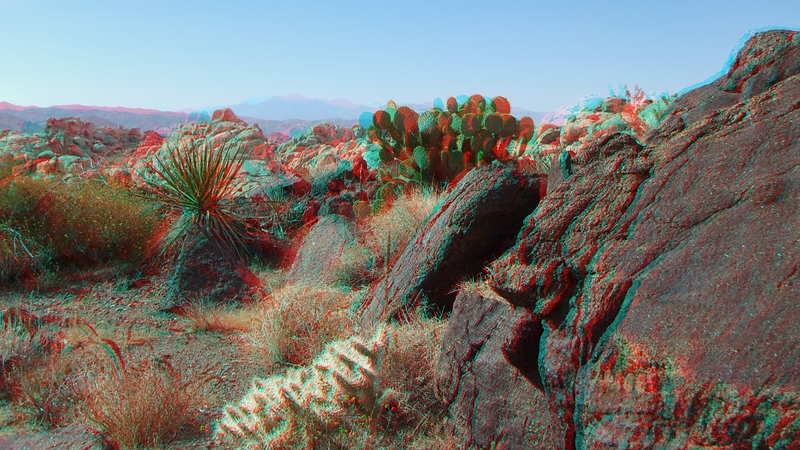 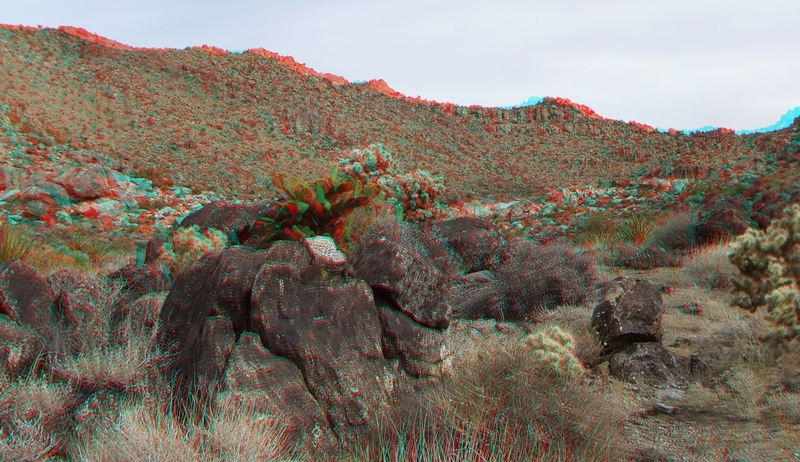 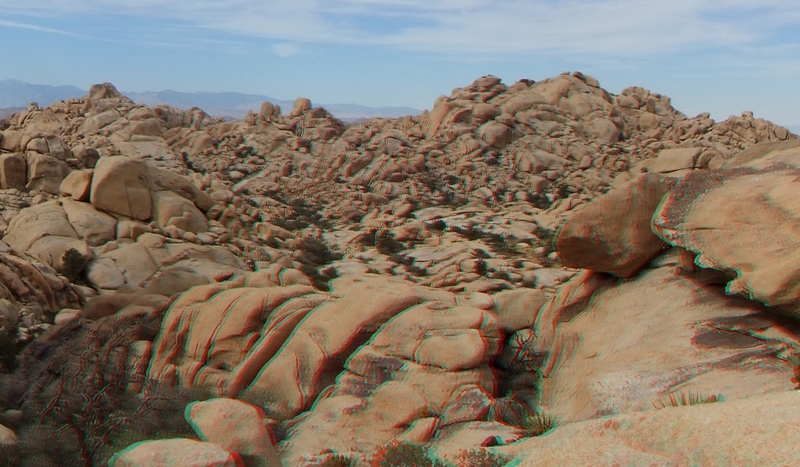 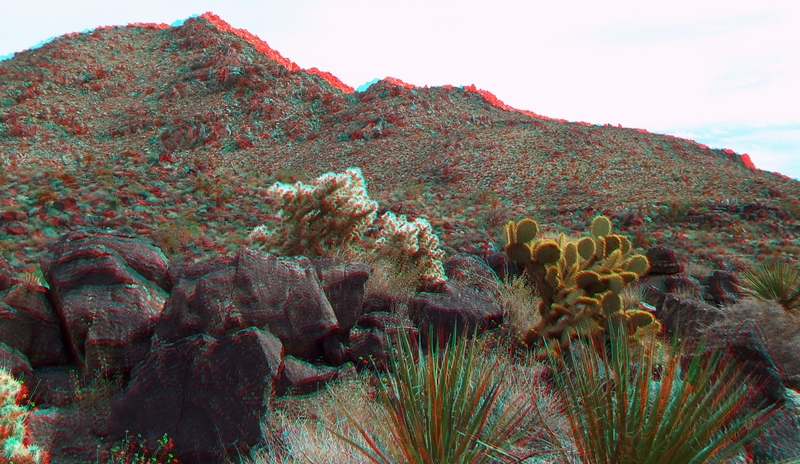 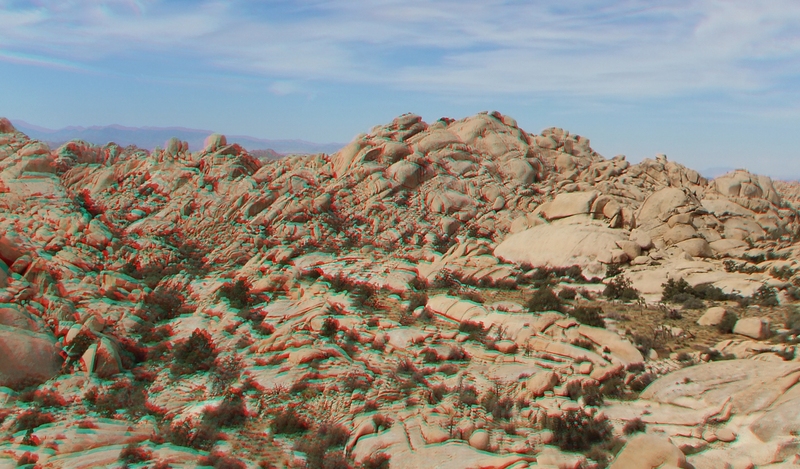 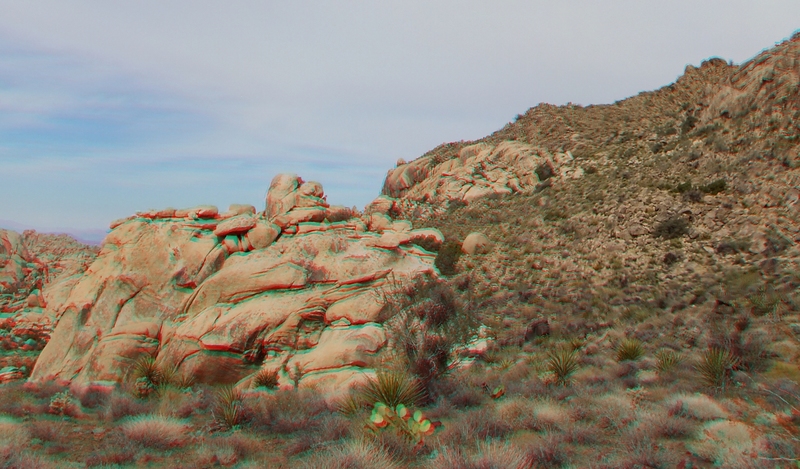 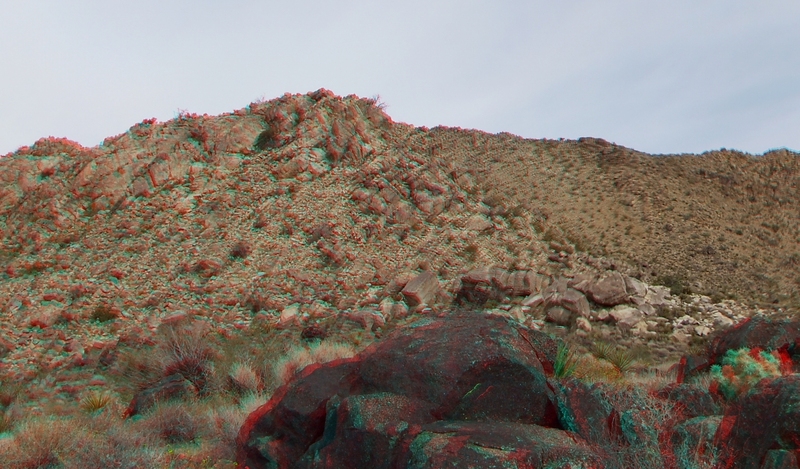 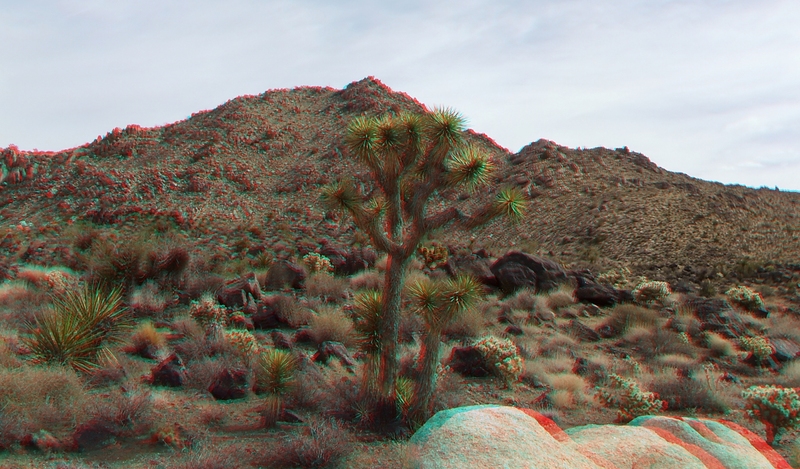 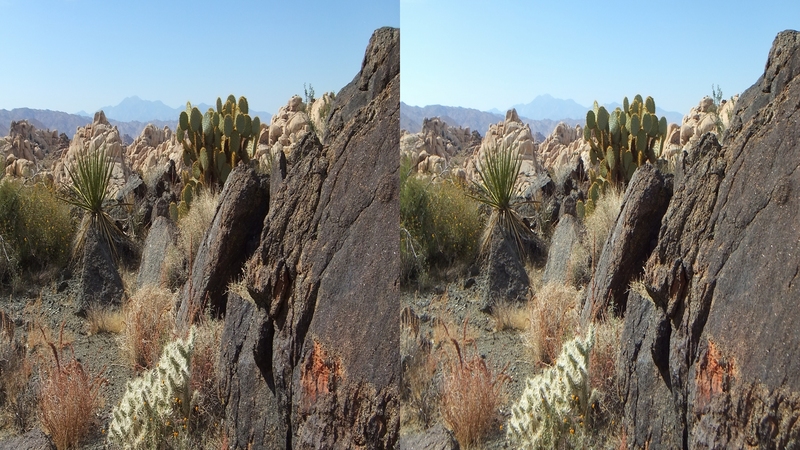 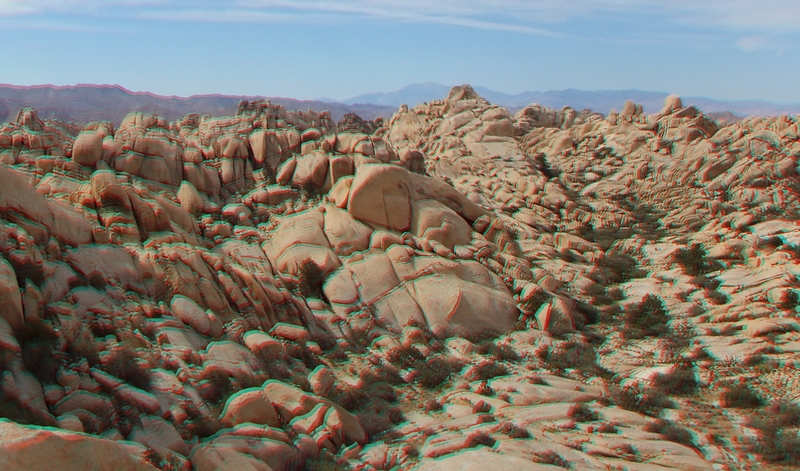 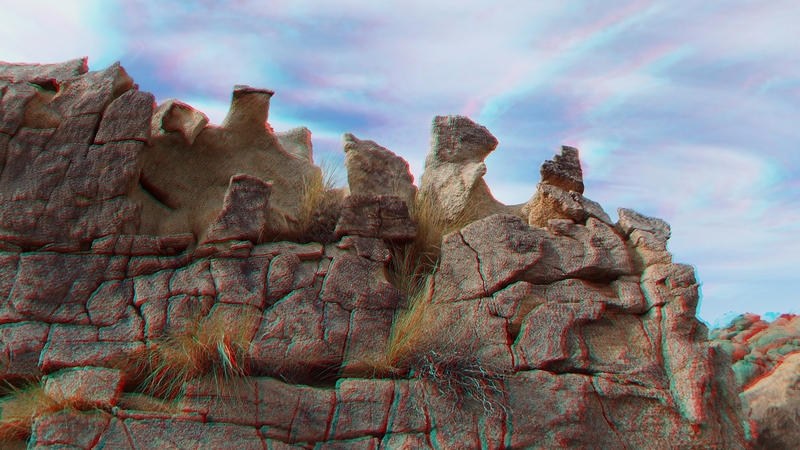 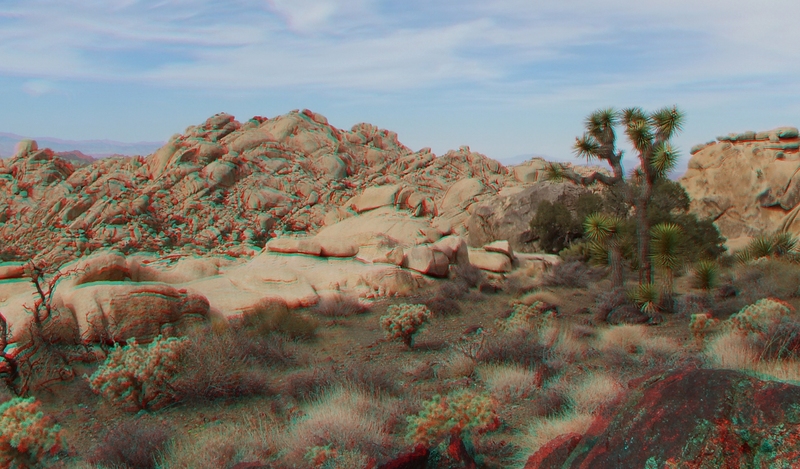 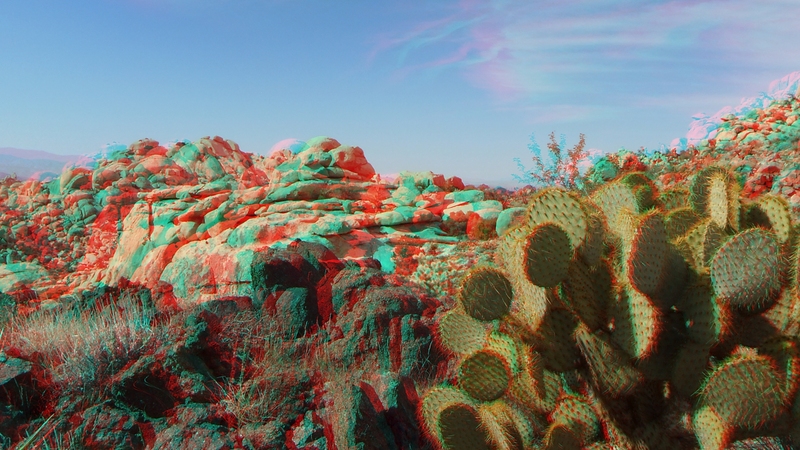 I hope you enjoyed the 3D images.